Heathrow Airport Holdings Limited, formerly BAA, is the United Kingdom-based operator of London Heathrow Airport. The company was formed by the privatisation of the British Airports Authority as BAA plc, and was once a constituent of the FTSE 100 Index. The company also operated Gatwick and Stansted airports, and several other UK airports. BAA plc was bought in 2006 by a consortium led by Ferrovial, a Spanish firm specialising in the design, construction, financing, operation and maintenance of transport, urban and services infrastructure. In March 2009 the company was required to sell Gatwick and Stansted airports, and over the following years sold all its airports other than Heathrow. The company was renamed Heathrow Airport Holdings in 2012 to reflect its main business. The company's head office is located in The Compass Centre on the grounds of London Heathrow Airport in the London Borough of Hillingdon. The company makes money from charging landing fees to airlines and increasingly from ancillary operations within those airports such as retail and property. The British Airports Authority was established by the passing of Airport Authority Act 1965, to take responsibility for three state-owned airports – London Heathrow Airport, London Gatwick Airport and London Stansted Airport (now owned by the Manchester Airports Group). In the following few years, the authority acquired responsibility for Glasgow International Airport, Edinburgh Airport, Southampton Airport and Aberdeen Airport. The Authority took on the Ministry of Civil Aviation Constabulary in 1966, which was renamed to become the British Airports Authority Constabulary, and was disbanded between 1974 and 1975. As part of Margaret Thatcher's moves to privatise government owned assets, the Airports Act 1986 was passed which mandated the creation of BAA plc as a vehicle by which stock market funds could be raised. The initial capitalisation of BAA plc was £1,225 million. In the early 1990s, the company sold Prestwick International Airport (now known as Glasgow Prestwick Airport). In December 2005, BAA made a winning bid of £1.2 billion for a 75% stake in Budapest Ferihegy International Airport, the largest airport in Hungary, which was being privatised by the Hungarian government. In July 2006, BAA was taken over by a consortium led by Ferrovial, following a bid which valued the company at £10.1 billion ($20 billion). As a result, the company was delisted from the London Stock Exchange (where it had previously been part of the FTSE 100 Index) on 15 August 2006. Following the take-over, the decision was made to sell the stake in Ferihegy and this was completed in June 2007, when a consortium led by Hochtief AirPort of Germany purchased the stake. BAA expanded into international operations, including retail contracts at Boston Logan International Airport and Baltimore-Washington International Thurgood Marshall Airport (through its subsidiary BAA USA, Inc.), and a management contract with the City of Indianapolis to run the Indianapolis International Airport (as BAA Indianapolis, Inc.) before ultimately selling off its US division to Prospect Capital Corporation in July 2010. After an inquiry from August 2008 – March 2009, the UK Competition Commission announced that BAA would be required to sell three of the seven UK airports it owned at the time. These were Gatwick, Stansted and either Glasgow or Edinburgh airports within two years over fears the monopoly position held by BAA over London and Scotland's airports could have "adverse effects for both passengers and airlines". The sales were forecast to raise between £3.5bn and £4bn. BAA announced plans to sell Gatwick Airport on 17 September 2008. At that time, Gatwick Airport was valued at £1.8bn by regulators and it appeared that multiple firms including Macquarie Group, Manchester Airports Group, Fraport and Virgin Atlantic were interested in this sale, either on their own or as part of a consortium of companies. Ferrovial and its partners (Government of Singapore Investment Corporation and Quebec's state pension fund) had been seeking £1.8bn- £2bn when they opened the bidding process. Eventually, the sale was confirmed on 21 October 2009 and formally completed on 3 December 2009, for a fee of £1.51 billion. This was almost 25 per cent less than BAA had expected Gatwick would fetch when the sale was announced a year previously. BAA sold the airport to Global Infrastructure Partners, the fund backed by Credit Suisse and General Electric, who also operate London City Airport. Ferrovial, the majority holder in BAA, said that it expected to make a capital loss of around 142 million euros (US$212.6 million) against its consolidated earnings following the sale. On 19 October 2011, BAA announced that Edinburgh Airport would be put up for sale in early 2012 with an aim to handing over the running of the site to a new owner by summer 2012. Numerous groups were reported to have expressed interest, including a consortium of Scottish businesses headed by former Edinburgh Airport Manager, and Fraport, the owners of Frankfurt Airport, Germany. The airport was sold to Global Infrastructure Partners in 2012. On 18 January 2013, Heathrow Airport Holdings Limited announced the sale of Stansted to the Manchester Airports Group, a holding company owned by the 10 borough councils of Greater Manchester. In May 2014, Heathrow Airport Holdings announced the appointment of John Holland-Kaye, current Development Director, as chief executive officer, succeeding Colin Matthews on 1 July 2014. The company agreed on 16 October 2014 to sell Glasgow, Southampton and Aberdeen airports to AGS Airports Ltd, a consortium of Ferrovial and Macquarie Group for £1 billion, to focus solely on Heathrow. As BAA, the company was adamant that its name did not officially stand for anything. It was still widely (albeit erroneously) referred to as the "British Airports Authority" by both the media and the public – even though the Authority was dissolved following the 1986 privatisation. The company's former logo, composed of three green triangles, was created by John Lloyd and Jim Northover of the design consultancy, Lloyd Northover, at the time of the privatisation in 1986. The original BAA plc was acquired in 2006 by Airport Development and Investment Limited (ADI), a new company formed by the Ferrovial consortium. In October 2008 ADI changed its name to BAA Limited, and on 15 October 2012, the company announced that it had changed its name to Heathrow Airport Holdings. Colin Matthews, Chief Executive of the company, said that, given the reduction in the number of airports owned by the company, the BAA name was no longer appropriate; after the sale of Stansted, Heathrow Airport would account for 95% of the company's business. Each remaining airport owned by the company has reverted to operating under its own name rather than the BAA banner. As a major client of the UK construction industry, it is a member of the Construction Clients' Group, which represents client views to the government's Strategic Forum for Construction. 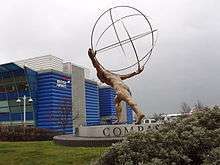 The company's head office is located in the Compass Centre on the grounds of London Heathrow Airport in Hounslow. The Compass Centre previously served as a British Airways flight crew centre. When London Heathrow Terminal 5 opened on 27 March 2008, British Airways staff, including crew check-in staff, relocated from the Compass Centre to Terminal 5. The original BAA plc's head office was located near London Victoria station in the City of Westminster, London. BAA was a founding member of Flying Matters, a coalition of business groups, trade unions, tourism groups and the aviation industry (airports, airlines, aerospace manufacturers and air traffic control) launched in June 2007 to "balance the argument around issues of aviation and climate change" arguing that aviation does not contribute significantly to climate change, and that an expansion of aviation will aid the developing world, benefit social justice, and is essential for UK tourism and for the UK economy. The group was dissolved in April 2011 after several members, including BAA, left the coalition. Heathrow Express – Owns and operates. Heathrow Connect – Joint operation with Great Western Railway (GWR). The company has garnered criticism for its handling of Heathrow, namely its predominant placement of shops rather than extra security aisles. After much criticism for this, BAA removed some shops to provide extra security lanes. The Economist writes that retail is important for BAA at Heathrow because, by law, landing charges are much less than those of similar-scope airports and shops help make up the difference. BAA has been accused of under-investing in snow and ice-fighting technology at Heathrow, which led to runway closures and severe delays in December 2010. In July 2007 BAA sought an injunction preventing potential protesters involved in the Camp for Climate Action from approaching its London Heathrow Airport. The injunction specifically targeted anyone belonging to, or protesting in the name of, AirportWatch, The No Third Runway Action Group and Plane Stupid. However, Airport Watch members included Friends of the Earth, Greenpeace, the Campaign to Protect Rural England, the World Development Movement, the National Trust and the Royal Society for the Protection of Birds – all of whom were caught by what became known as the 'Mother of all Injunctions'. BAA denied seeking a blanket ban on airport protest. In the end BAA won a very much more limited injunction and the camp went ahead amid considerable worldwide publicity. Afterward, Duncan Bonfield, BAA director of corporate affairs, and Mark Mann, BAA head of media relations, resigned. BAA's pricing structure mostly excludes General aviation access to their airports by either banning the movements of light aircraft, or setting high fees and mandatory handling charges. The total charges for landing, one night of parking, and mandatory handling for a Cessna 152 (including VAT) in 2013 was: £234 at Aberdeen, £193 at Glasgow and £187 at Southampton. Heathrow Airport does not permit any flights for recreational, commemorative, charity and record breaking purposes, light twin engined private aircraft and all light single engined aircraft. BAA has since taken steps to improve this issue, including the waiving of mandatory handling fees for light aircraft at Aberdeen and Southampton. In 2014, the equivalent charges were: £29.65 at Southampton and £64.63 at Aberdeen. However the fees remained the same at Glasgow. It was also acknowledged that Heathrow Airport's runways are 99% used, therefore the charges were set on the basis of very high demand and the lack of supply. 1 2 3 "Results for the year ended 31 December 2015" (PDF). Heathrow (SP) Limited. Retrieved 26 October 2016. ↑ Calder, Simon (17 October 2014). "What Glasgow, Aberdeen and Southampton airports sell-off means for passengers". The Guardian. Retrieved 20 October 2014. 1 2 3 The Economist, The man who bought trouble. Consulted on 18 July 2007. ↑ "BAA closing in on Hungarian deal". BBC News. 8 December 2005. Retrieved 7 July 2009. ↑ BAA USA Acquired by New Owners, to be Renamed AIRMALL® USA – PITTSBURGH, Aug. 2 /PRNewswire/. Prnewswire.com. Retrieved on 16 August 2013. ↑ Osborne, Alastair; Butler, Sarah (17 August 2008). "Commission to break up BAA monopoly". The Telegraph. Retrieved 20 October 2014. ↑ Done, Kevin (18 March 2009). "BAA ordered to sell three airports". Financial Times. Archived from the original on 22 April 2009. Retrieved 18 March 2009. ↑ "Gatwick Airport put up for sale". BBC. 17 September 2008. Archived from the original on 30 September 2009. Retrieved 2 November 2009. 1 2 "BAA sells Gatwick for £1.5bn". FT.com. 20 October 2009. Archived from the original on 5 November 2009. Retrieved 2 November 2009. 1 2 "BAA announces the sale of Gatwick Airport". BAA. 21 October 2009. Retrieved 2 November 2009. ↑ "BAA sells Gatwick airport at a loss". Reuters. 21 October 2009. Archived from the original on 23 October 2009. Retrieved 2 November 2009. ↑ "BAA to sell Edinburgh Airport over competition rules". BBC News Online. 19 October 2011. Retrieved 20 October 2012. ↑ "Aberdeen, Glasgow and Southampton airports sold in £1bn deal". BBC News. 16 October 2014. Retrieved 20 October 2014. ↑ Thomas, Nathalie (15 October 2012). "BAA rebrands as 'Heathrow'". The Telegraph. Retrieved 20 October 2014. ↑ "About us". Heathrow Airport Holdings. 2014. Retrieved 27 February 2014. ↑ "BA Recruitment." British Airways. 3 March 2006. Retrieved on 2 October 2010. ↑ Paylor, Anne. "T5 Prepares to Go Live." Air Transport World. 1 March 2008. Retrieved on 2 October 2010. ↑ "BAA plc Head Office, Victoria, London." BAA Limited. Retrieved on 2 October 2010. "BAA plc 130 Wilton Road London SW1V 1LQ:"
↑ "Corporate website – about". Flying Matters. 20 December 2007. Archived from the original on 23 January 2008. Retrieved 23 December 2007. ↑ "Voters in key marginals shun Conservative proposals for higher taxes on air travel". Flying Matters. Archived from the original on 16 March 2008. Retrieved 7 July 2009. The text of this source is the same color as the background; highlight it to read. ↑ "Travel industry to launch climate-change lobby group : Gatwick Airport News Stories". Uk-airport-news.info. Retrieved 7 July 2009. ↑ "Airline industry lobby group grounded from April". Travel Weekley. ↑ Sinead Holland (28 February 2013). "£1.5 billion Stansted Airport sale complete". Harlow Star. Retrieved 1 March 2013. ↑ "Sir Seewoosagur Ramgoolam International Airport, Mauritius". ↑ Has Heathrow's Reputation Been Damaged? BBC News Online, 21 December 2010. ↑ "The mother of all injunctions". New Statesman. 13 August 2007. Retrieved 7 July 2009. ↑ "BAA wins Heathrow protesters ban". BBC News. 6 August 2007. Retrieved 7 July 2009. ↑ "Heathrow protesters set up camp". BBC News Online. 12 August 2007. Retrieved 7 July 2009. ↑ "Two top press officers resign from BAA | Business | Reuters". Uk.reuters.com. 22 August 2007. Retrieved 7 July 2009.